It's competition time again! Enter your homemade wines in the Orange County Fair Homemade Wine competition and the San Diego County Fair Homemade Wine competition. Cheesemakers can show off their skills at the San Diego County Fair Homemade Cheese contest, too! These are fun ways to get feedback on your skills, and meet fellow winemakers and cheesemakers. See more information on all of these contests below. Let us teach you how to make award-winning wines in our Basic Winemaking from Fresh or Frozen Grapes 2-part seminar series. 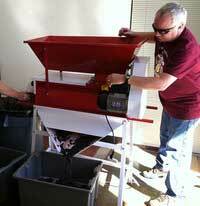 We will go through all the basics to make the best wines from fresh or frozen grapes. We are also repeating our sold-out Vineyard Installation and Management seminars again in June, if you would like to take the plunge and start your own vineyard. You can also step up your cheesemaking skills at our Advanced Cheesemaking Workshops with Venissimo in June - more information below. Seating is very limited in these workshops, sign up today! At 10 am join us for a Goat Cheeses workshop, where we'll show you how to make fresh chevre plus aged goat cheese. The possibilities are endless! Discover all the benefits of goat milk while enjoying oodles of samples in various stages of maturation. This is a fun and interactive adventure where you'll learn what makes goat milk so special and how to make perfect chevre at home! Workshops are $75 each, limited to 14 participants. Sign up for both and get a FREE lunch too! 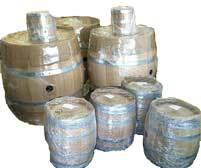 Preorders must be placed by Sunday, August 17th so that we can get the barrels in stock for harvest season. 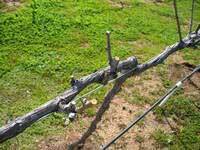 Interested in learning more about growing wine grapes or planning to put in your own vineyard? 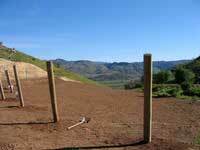 Curds and Wine will be hosting Vineyard Installation and Management Seminars in June. Led by Keith Wasser, local vineyard owner featured on a recent episode of "A Growing Passion" on KPBS, will give you all the basic information you need to plant and maintain your own grape vines. Please contact us if you would like to drop off your wine entries before 5/21/14 at Curds and Wine, we can take your entries in to the fair on drop-off day for you. All entries must be registered online and properly labelled for entry with accompanying entry forms if dropped off at Curds and Wine. Please note: we will not be able to take entries for the Homemade Cheese competition at Curds and Wine this year, all entries must be taken in by contestants personally to the Fair on June 29th. The Orange County Wine Society, in conjunction with the Orange County Fair, is proud to sponsor the 37th annual Orange County Fair Wine Competition. 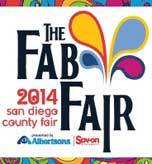 This will be held on Saturday June 7, 2014 at the Orange County Fairgrounds, Costa Mesa. All amateur winemakers in California are invited to submit their wines for judging. Last year there were 760 entries from all parts of California. VIDEO: See a video of the 2012 competition here. Wine Entries are to be submitted online. This will allow you to quickly submit your wines, calculate fees, make changes up until the deadline, enter the Wine Label Competition, and minimize errors. There are instructions and a tutorial video that will guide you through the process. We suggest that you take advantage of them before you begin. The link for entering your wines is here . More information is available at their main site. DEADLINE: Last day for entries is May 17, 2014. All wines must be entered online, dropped-off and shipped by that date. Curds and Wine is a drop-off point to have your wine(s) shipped to the competition. You must bring your wines already labelled appropriately and registered online with shipping prepaid first, please also bring all entry forms and checks; you will chose Curds and Wine as your drop-off location when you register your wine(s) online. Please remove any foils, capsules and wax. 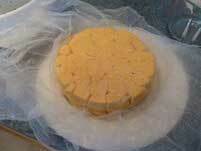 Curds and Wine is not responsible for entries damaged in shipping or inaccurately labeled wines. In keeping with recent competitions, awards will not be announced the day of the event with the exception of the "BEST OF SHOW" awards. This is being done to allow for the Competition Reviewing Committee to verify the accuracy and consistency of recommended medals and scores. This insures the quality and standards of the competition are met. The awards, insignias and judging critique sheets will be mailed 4-6-weeks following the competition. Award ribbons will be given this year for Double-Gold, Gold, Silver & Bronze and Honorable Mention Awards. Engraved Plaques will also be given for the Best of Show in the White, Red, Fruit and Dessert categories. Results will be posted approximately 2-weeks following the competition on the Orange County Wine Society web site at www.ocws.org under Homewine Competition. If you missed out on preordering these outstanding wine kits we do have a few extra, contact us to check availability and to hold a kit for you. Winexpert has re-released Diablo Rojo, now available again at Curds and Wine! This easy-drinking red is dark purple in color with a nose of blackberry jam melded with creamy vanilla aromas and a touch of tobacco. The finish is long and fruit-filled, with the perfect amount of toasty oak. Off dry, this wine is perfect for enjoying right away, delicious with robust foods and excellent all on its own. Get yours today for $84.95 at Curds and Wine!